Bağlama is the most commonly used string folk instrument in Turkey. It takes different names according to the regions and according ti its size such as Baglama, Divan Sazi, Bozuk, Çögür, Kopuz Irizva, Cura, Tambura, etc. Karadeniz Kemencesi is a bowed Turkish folk instrument. As can be surmised from its name it is an instrument widely used in the Black Sea Region. Its body is made from mulberry, plum and juniper woods. 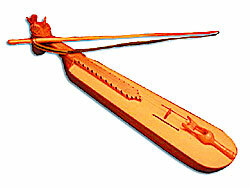 The wooden part of the bow generally rose wood or box wood. Horse hair is tied to th e ends of the bow. Kemence is a three-string instrument. While kiris strings from gut used be put on kemences, these days mostly metal strings are used. Kemence is an instrument without pitches and it is possible to get from it all types of chromatic sounds easily. It is generally played by pressing two strings at the same time nad getting parallel quarter notes. It is furthermore played with a special technique which is achieved with wrist movements. Zurna is aTurkish folk instrument of the wind type. Because of its strong sound it is generally played in the open air, on occasions such as village weddings, sending off the boys to military sercice, sport encounters, folk dances and similar ceremonial events. 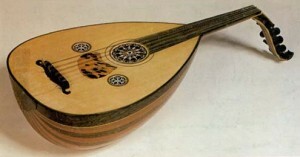 It was the first melody instrument of theh Mehter teams (Jannisaries Band) in the Ottoman period. It was also used in some traditional theater (orta oyunu) performances. 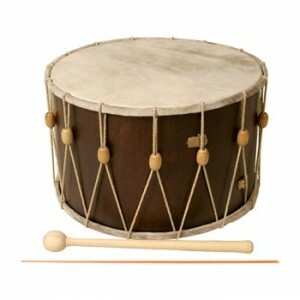 It is generally accompanied with a drum. 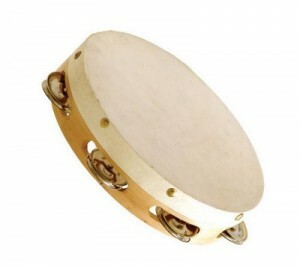 Because of the difficulty of its intonation and its high sound level, it is not used in musical groups. However, in the recent years it started to be used by some folk music groups. Zurna has a sound range of nearly two octaves and has eight melody keys with seven of them on the front and one on the back. The key at the back is so located as to come between the first two notes towards the reed section at the front. The keys are generally round with 6-8 mm diameters. The length of the instrument changes between 30-60 cm and widens out like a funnel starting from the part the melody holes end. This section is called the kalak. At the blowing end there is a thin pipe like rod over which the reed goes. This rod is called Metem. A separate circular piece with a hole in the middle is put over the Metem to help the breathing technique. This piece is called Avurtluk. The most common zurna playing technique where while the air collected in the cave of the mouth is blown out from the reed, inhaling through nostrils occurs simultaneously. There are seven holes besides the melody keys on the kaalk section which are smaller in diameter. They are called seytan deligi (devil’s hole) or cin deligi (genie’s hole). They can be closed with wax or a similar material according to the sound hunting of the player. The instrument which changes between 60 and 30 cm in length as we have already mentioned is divided into three types according to its sound: Kaba Zurna, Orta Kaba Zurna and Cura Zurna (Zil Zurna). They are generally made from wood of trees such as plums, apricots, walnut, saber etc. Davul (drum) is the oldest known percussion instrument. It can be in different siyes and is generally used in open spaces on occasions such as weddings, folk dances or different ceremonies. It consists of a circular wooden frame and a hoop made from two skins and covered with skin which is put on the frame with the help of strong strings or leather ribbons. The ney is the principal wind instrument in Turkish classical music. The term is derived from the Persian nay, “reed”. There are seven finger holes, six on the front of the instrument, and one on the back. A mouthpiece, generally made of buffalo horn, called baspare, is attached to the blown end. Silver rings called parazvane are attached to either end of the instrument to prevent cracking. The lowest tones are called the “dem” (breath) tones. The semitones unique to classical Turkish music are achieved by opening some of the holes either half or one fourth of the way. Other semitones are achieved by a sight turn of the head. 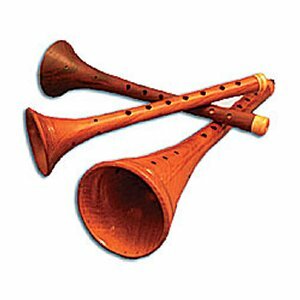 The ney, together with the kudüm, are two main instruments of Mevlevî music, but have been widely used since very early periods in secular music as well. There are several different sizes of ney, each with its own name, including (from low to high register) bolahenk, davut, sah, mansur, kizneyi, müstahsen, and siürde. These names are used as tunings (ahenk) is classical Turkish music. Of the twelve sizes of neys, seven are tuned to natural tones, and five to half tones. The half tone of each of the chief tones is known as maybeyn. There are also neys an octave above the lowest register neys such as bolahenk and davut neys; these are known as nisfiye neys. 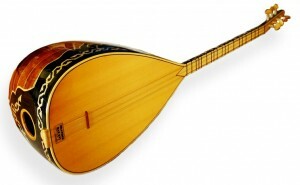 The ud is a large-bodied, short-necked instrument belongingto the lute family. Besides Turkey, it is played in the entire Arab world including Tunisia, Morocco and Algeria, as well as Iran and Armenia. In Iran, it is known as the barbat. The tanbur is the most important plucked stringed instrument of Turkish classical music. The word, a form of the Arabic word “tunbur”, is generally considered ro derive from the Sumerian word “pantur”, which was tha name for a long-necked string instrument with a half-spherical body. The word later came to be used in Iran and Central Asia for a group of long-necked instruments with pear-shaped bodies, which more resembled today’s baglama. 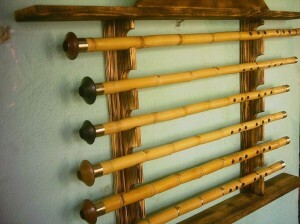 Similar instruments still played by the Turkic peoples of Asia are called by names such as tanbura and dombra. The tambur’s body is a half-sphere up to 35 centimeters in diameter, constructed of staves glued together. The tied frets were originally made of twisted gut, but today, with the exception of Necdet Yasar, almost all tanber players use frets of nylon monofilament. The numer of frets ranges from 45-55. Modern tanburs generally have seven strings, but tanburs of the 18th and 19th centuries had eight strings. In recent years, some players have had eight-string tanburs constructed. The zither is called ‘kanun’ in Turkish. It is a stringed instrument played on the lap and the strings are stretched across the upper surface of a wooden box. Skilled craftsmen may use seven kinds of wood in making one zither. The upper surface is made of sycamore wood, the lower surface of pinewood, the bridge is of maple. The design in the smides and the upper surface is cut out of rose wood and white pine. The soundboard is completed by using calf leather giving the zither its rich resonance. The tuning pegs and the peg locks are made of hardwood, either rose or ebony. The small tuning levers or tuning keys, are called ‘mandal’. It is played with the help of a plectrum, one fastened to each index finger by an adjustable metal ring. This is a goblet-shaped drum, played in several parts os Anatolia, popular among women musicians as well. It is originally made of red clay. The goat or cow hide stretched across the mouth creates a pleasing sound, especially when heated. 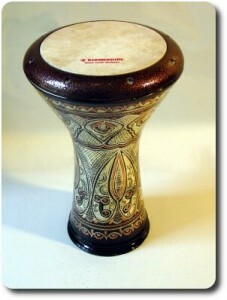 The darbuka is known by several names throughout Anatolia, including dümbelek, deblek, dömbek, güpgüp. It is also a custom among women to play washbasins, copper buckets and copper jugs.